February | 2015 | HowDoYouLandscape? 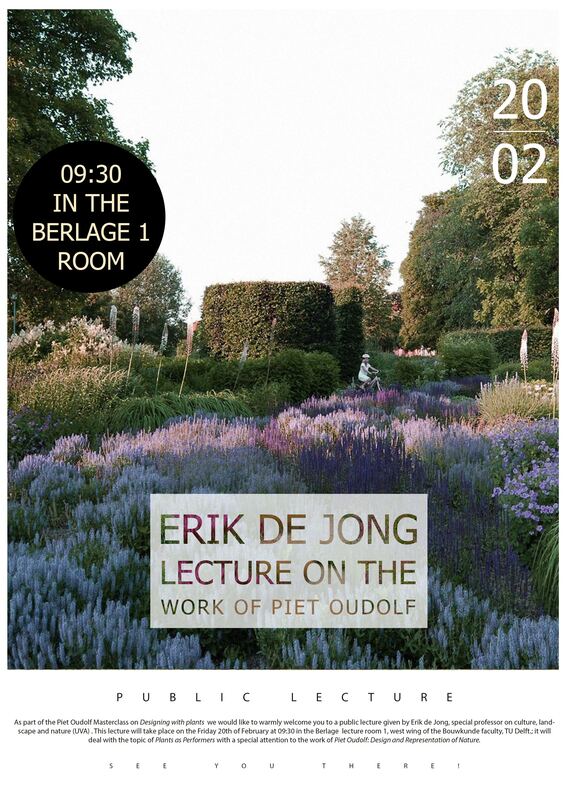 As part of the Piet Oudolf Masterclass on Designing with plants we would like to warmly welcome you to a public lecture given by Erik de Jong, special professor on culture, landscape and nature (UVA). 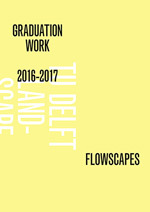 This lecture will take place on the Friday 20th of February at 09:30 in the Berlage lecture room 1, West wing of the TU Delft Faculty of Architecture and the Built Environment; it will deal with the topic of Plants as Performers with a special attention to the work of Piet Oudolf: Design and Representation of Nature. Please note: The lecture and the masterclass have been initiated by a group of students of the faculty and is encouraged and supported by the Chair of Landscape Architecture. We feel thankful to share this announcement here and invite our students, staff and interested public with great gratitude towards the student group, Piet Oudolf and Erik de Jong. Abstraction and Realization: Good Life and the City in the Anthropocene / 2014-2015 / The Berlage. The Netherlands’ largest and most beautiful Garden Idea Park – Appeltern chose a design of my practice DGJ Architects & Landscapes as hommage to Vincent van Gogh. The garden information park Appeltern has been laid out in a way that will give you inspiration and help you with your own garden. A walk through the 23-hectare park is an experience for all your senses. The quiet, the space and the nature ensure a great day out. You will return home full of ideas. 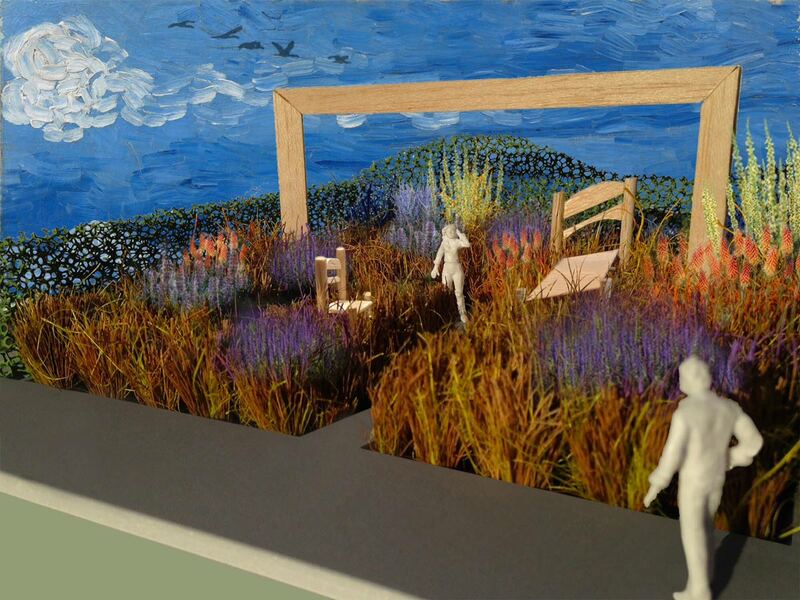 The garden design by DGJ Architects & Landscapes is conceived as a three dimensional living painting to walk through. Inside several elements of the work of Van Gogh are reflected. The characteristic ‘brushstrokes’ are represented with lushly growing spike-shaped flowers of perennials form the biological urban nursery Groenehelden.com . Through the use of perennials the Garden shall change it’s image throughout the two garden seasons of 2015 and 2016. The endless and timeless character of Van Gogh’s work is expressed with this changes and a ∞-shaped path. In the loops of the ∞ there are two chairs that seam not to work in perspective. These are referring to the famous painting ‘Slaapkamer’ form 1888. Visitors may sit on these chairs – but they shall not be comfortable. ‘De Tuinen van Appeltern’ is in the countryside between the Rivers Maas and Waal. The next larger cities are Tiel, Nijmegen and Oss. It can best be reached by car. Auto. The Garden Festival in Appeltern with 10 thematic gardens as hommage to Vincent van Gogh starts may 14 2015. Other events will follow throughout the season. On 29 July 2015 it will be exactly 125 years since Vincent van Gogh (1853-1890) died. The Van Gogh Europe Foundation, a collaboration of around 30 organisations is seizing this opportunity to honour the Dutch artist under the theme ‘125 years of inspiration’.